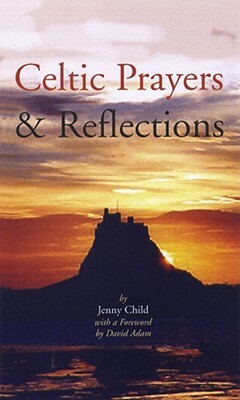 In this book, Jenny Child offers an insightful collection of prayers, inspired by her visits to the holy isle of Lindisfarne. In this book, Jenny Child offers an insightful collection of prayers, inspired by her visits to the holy isle of Lindisfarne. The miscellany provides prayers and thoughts for various times of the day, as well as reflections for important times of the year. Here are prayers from the heart and the hearth. In the great tradition of Celtic prayers these are very much prayers and reflections from the ordinary daily round and from the home. There are uplifting moments and anxious moments, there are inspirational times and times of sorrow and repentance. Some prayers read like hymns, and could easily be sung, others search the heights and depths of our faith. In all we are allowed to share in the daily experiences that lead Jenny to be aware of her God. Though I could and would be happy to use many of these prayers within a service, they are essentially prayers to be used in our own personal devotions. They are prayers to inspire us to use our own words and to bring our hopes and our fears openly before our God. Jenny’s prayers are to encourage us to be at home with God and to rejoice that God is at home with us. I commend these prayers to you as a sincere attempt to express that God is with us and in him we live and move and have our being. How often in our busy 21st century lifestyle do we feel we want to be somewhere ‘far from the madding crowd’? Each one of us needs a place to which we can retreat to recharge our spiritual batteries, where we can stop and listen and spend time with the One who knows us best – God our Creator. We may have a quiet refuge in our minds or somewhere real which we can visit. My special place is the Holy Island of Lindisfarne – a tidal island in Northumbria in north-east England. It is here that both Aidan and Cuthbert, two of the early Celtic saints, lived their lives in service to God and their fellow beings. Here the seals still sing near St Cuthbert’s Island and many species of birds find a safe haven. It is my hope that you too will find your special place where you can be alone with God and experience the beauty of his Creation. As I sleep, surround me. by the warmth of your love. and open the shutters on a new day. the challenges of a new dawn. Help us to live this day to your glory. far from the toil and strife. revitalise us with your power. and sense your loving presence. you give us hope and renewal. for all who have inspired us, for our loved ones. for the promise of a new day. in our travelling and our staying. Abide with us, each day, each night. and keep us from all that is evil. in the silent hours of darkness. who are bent on evil deeds. and give peace to your world. and we need your presence to gladden our hearts. as did your Emmaus-bound disciples. with your protection, O God. surround me with his presence. guard me while I sleep. Into your hands, I commit myself this night. May the hours of darkness hold no harm for me. and cover me with your protecting wings. you bring down the curtain of night on a weary world. and lay our burdens at your feet. who drink from the chalice of grief this night. and the anguish of sorrow. you encompass us with love. that we may reach out to others. that all may see the love of Christ. that we may reflect your praise. by my life may I show people Jesus. that others may be drawn to the light of Christ. and go before us, guiding us. through the rough places of life. because you are the Good Shepherd. our achievements and unfulfilled dreams. Save my soul from sin and wrong. in our dying, be receiving us. yet conquered by your Resurrection. and so apply our hearts to wisdom. of your timing for me. less ready to be so perplexed. more humble like Jesus, my Lord.